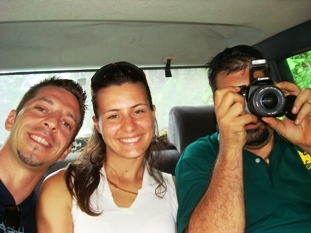 MAE HONG SON TOURS. CODE.MHT 006: TOUR 4DAYS 3NIGH: "OVER VIEW ON TOP MOUNTAIN & PAI FAIRYLAND" OB LUANG CANYON,PAI,BAN RAK THAI, PANG MAPHA, LAKE-PHUKLON COUNTRY CLUB. Travel: trip route by Highway No.108 from Chiang Mai province to Ob Luang gorge or canyon-Mae Sariang-Thung Buatong Forest Park October to November. Khun Yuam Blossom period of Bua Tong is November till late December every year-Long Neck Padong Tribal Villages-Returning route by Highway No.1095 Mae Hong Son town-Ban Rak Thai,Mae Aw(the Thai-loving village)-Pang -Ung lake-Phuklon Country Club-Fish Cave national park (tham pla in Thai)-Them Lod Forest Park or Lod Cave-Pang Mapha (The winding road is a sensual joy)-Pai (and see Heaven. Heaven does really exists in Pai)-Chiang Mai.Go & Back with curves From Chiang Mai to Mae Hong Son it is not easy.drive along the mountainous road is about "800 kilometres" 4 Days 3 Night. 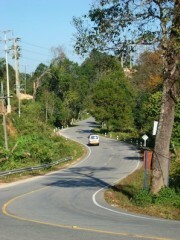 The winding road to "Pang Mapha" district is a sensual joy. and across a seemingly endless expanse of rolling forest. "Ob Luang gorge" or canyon. Hot district of Chiang Mai province. The Mae Cham river was originally called the "Salak hin". 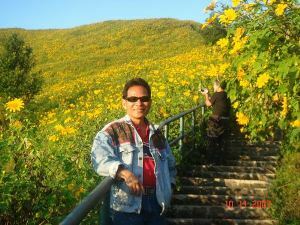 Park and nature: Wild- Sunflower field at "Doi Mae Ho"
"Mae Sariang" (Mae Sariang district of Mae Hong Son province). "Mae Sariang" a district town that has been by passed by the highway and by extensive modern development. "Khun Yuam" the Japanese army which entered Khun Yuam district during World War II. The facade of the "World War II Museum" in Khun Yuam. 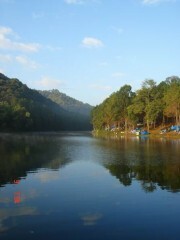 "Thung Buatong Forest Park" located in Mae U Kor Moo 6, Khun Yuam District, Mae Hong Sorn Province. "Mae Hong Son" Province are complex mountain ranges and likely still pristine virgin forest. "The Thai Yai" Culture Beloved sons boys are carried by the men of Mae Hong Son during the festival of Poi Sang Long. 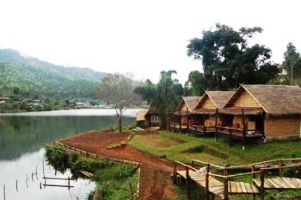 Mae Hong Sorn, the city of the mists, is a valley of "Pristine culture". "Wat Hua Wiang" You can explore such as Burmese style "temples". "Jong Kham Lake" has now been transmuted into a park and is a place of great. 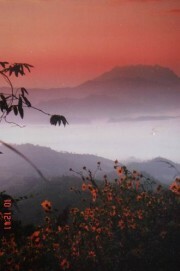 "Mae Hong Son" are faced with very cold weather during winter with mist. 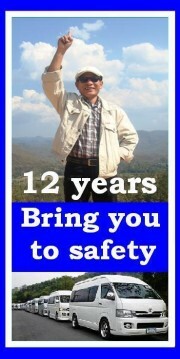 "Mae Hong Son" extremely hot weather in the summer. 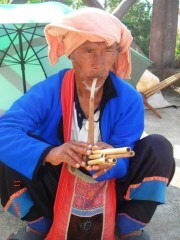 The hilltribe people consist of Karen,Long Neck Padong,Long Ear Karen,Red Karen,Lisu,Mhong,Lahu and Lua. Both the Shans. Long Neck Padong, Long Ear Karen,Red KarenTribal Villages. "Long Neck Padong" The number of rings increases according to her age. “Karen Long Ear” Woman Long Ear Hill Tribe. "Red Karen" or Kayah, are a Sino-Tibetan people, living mostly in Kayah State of Myanmar. 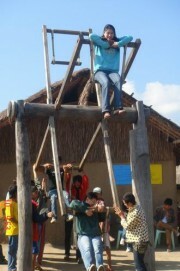 "Long Neck Padong Tribal Villages" Go & Back 2 hour long motor boat trip rafting along Pai River. 36 kilometre drive through rugged land scape. A scenic route with marvellous terraced cataracts to Ban Nam Phiang Din near the Thai-Burmese border. "The fish" seem to like to cool water of the cave. 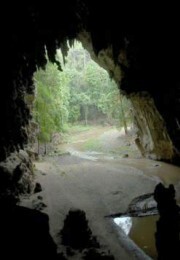 "Tham Lod Cave Forest Park" is situated in a forest in Pang Mapha district some 77 kilometers from town. Here nature has created an exotic subterranean wonder of "darkness and mystery"
“Lod Cave” Local people wait in front of the cave to provide their services as guides with lamps and go by raft to tour. The route “Thailand archaeology” And There are many other caves in Pang Mapha. 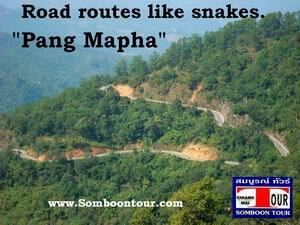 “Soppong” is on the main road, between Pai and Mae Hong Son town on the Mae Hong Son loop. The bouncy bamboo floor,smokey interior of his home the old man appeared with his , a traditional reed intrument. 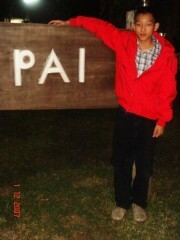 Overnight in "Pai" and see Heaven. Heaven does really exists in Pai. Enjoying a drink in one of Pai's many bars. Tasting the cold weather at the top of these high mountains whilst awaiting the dawn mists. 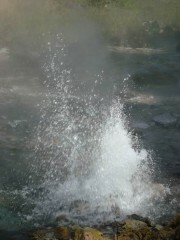 "Pong Dueat Hot Springs" (geysers) The temperature of the water reaches 99 degree centigrade. 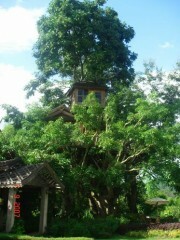 Welcome to Pai Treehouse Resort Relax and surround yourself with nature. Drivers in The professional path. The city is covered with the mist all year long. Maehongson gains its nickname of "the City of Three Mists" This province is also known as “Muang Sarm Mork” from the fact that it has dewy mist in the winter, forest fire mist in the summer and rainy mist in the rainy season. Trip route from Chiang Mai Hot Mae Sariang Khun Yuam Mae Hong Son Visit to this beautiful province rewards the traveler Mae Hong Son (Route 108) with 1864 curves, a distance of 349 kilometres. we take a 6 hour drive along the mountainous road is quite tortuous. 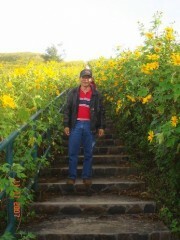 You have to go up and down along the hillside slope to Mae Hong Son province. Travel:trip routeby Highway No.108-Ob Luang canyon-Doi Mae Ho Mae Sariang-Thung Buatong Forest Park Khun Yuam-Long Neck Padong Tribal Villages-Mae Hong Son town. 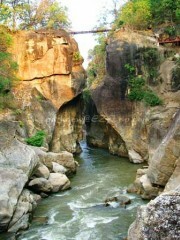 Ob Luang gorge or canyon (Hot district of Chiang Mai province). It is a steep sided canyon with high cliffs. The height of the canyon walls measured from the bridge to the average waterlevel is about 32 meters. The narrowest point of the canyon is not more than 2 meters wide while the whole canyon is about 300 meters in length. The Mae Cham river was originally called the "Salak hin". The river created a big but narrow canyon, which is called Ob Luang. Strong river current transformed rocks and cliffs into canyons and strangely shaped rock formations. The water force it's way past rocks and boulders and thus creating a magnificent sight. From 1966 to 1991 the park was administered as a forest part. 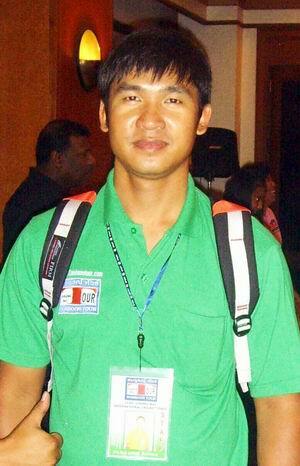 After more surveys by the Royal Forestry Department it was gazetted, in 1991, as the 68th national park of Thailand. 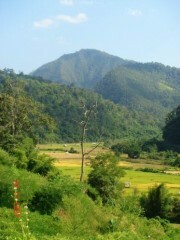 Mae Sariang (Mae Sariang district of Mae Hong Son province). Mae Sariang is a sleepy town southwest of Chiang Mai. 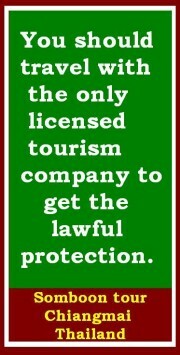 Because of the lack of activities it gets very few tourists for this area. From Chaing Mai to the Mae Hong Son province of Northern Thailand stopping first in the village of Mae Sariang. This is a lovely peaceful riverside town with very little to do and with fewer tourists than a lot of other places in this region. 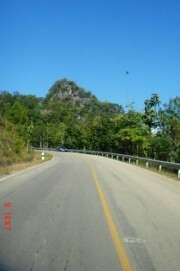 Khun Yuam (Khun Yuam district of Mae Hong Son province). Indigenous Cultural Center Located at Km. 200 on Highway No. 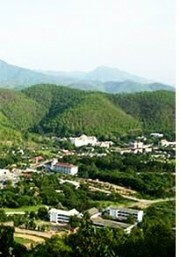 108, the centre has a considerable collection of Thai Yai and other hilltribes handicrafted products. It also displays military accessories and equipment of the Japanese army which entered Khun Yuam district during World War. Mae Hong Son Mae Hong Sorn Province borders Burma's Shan State on both the north and the west and the city of Mae Hong Sorn is a small a city. It was originally formed by a combination of wandering migrants which included people from Burma's Shan State, Thailand and some nomadic hilltribe peoples, and these are the people you see today living their lives in a traditional style because it's their nature to do so. Hidden deep in a valley ringed by misty mountain ranges, Sheltered by several high mountains and enjoying a cool climate almost all year round it is also one of the most environmentally protected. 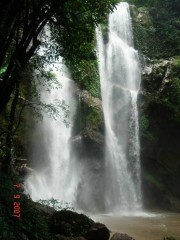 Over 75 percent of the entire province comprises mountains, forests and jungles. The province is bordered by Myanmar to the north and west, and a strong Burmese influence can be seen in the provincial capital’s temples and buildings. Isolated from much of outside world before because of the lack of good transportation and communication, it earned a reputation as “Thailand’s Siberia.” Inhabitants in Mae Hong Son are mixed: Thai, Thai Yai or Shan, who are related to Burmese tribes. Many hill tribe groups such as Lisu, Lahu, Hmong, Karen, are also settled in this sleepy town. Wat Phra That Doi Kong Mu is situated on a hill overlooking the town.The temple has two distinctive chedis which house the ashes of respected 19th century monks. In the viharn there is an unusual white marble Buddha. Wat Jong Kham is an often photographed temple which stands on the Jong Kham Lake. This temple houses an intricately carved sermon throne and the much revered Buddha image of Luang Pho To. Wat Jong Klang is famous for its paintings on glass. These paintings depict stories from the Buddha's previous incarnations as well as the Buddha's life. There is also a collection of impressive teak statues brought over from Burma. These statues are meant to depict characters from a Buddhist tale, using typical figures of Burmese society. Long Neck Padong Tribal Villages. Most of the province borders Myanmar (Burma) but there are, as yet, no legal border crossings.The remote North Western town and provincial capital of the same name is little more than a large village. Long Neck Padong Tribal Villages.One of the most exotic sights in Mae Hong Son is that of the Pa Dong Karens, a hilltribe community farming rice, tea and tobacco. 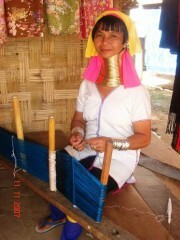 At Baan Nam Phiang Din, Karen women still attach brass rings to her neck and limbs to give a good appearance. 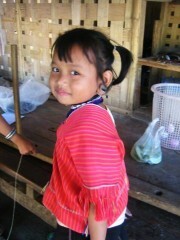 I had seen some young Karen girls (about 5-7 years old) have already attack the neck-rings. 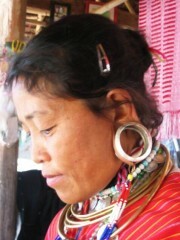 Certain Pa Dong females 'elongate' their necks from an early age with brass which is coiled around their necks to give a brass ring effect. The greater number of coils is believed to enhance physical beauty and increase aesthetic appeal. Older women wear as many as 20, or more, brass coils around their necks. Pa Dong Karens can be seen in their natural environment at Ban Nam Phiang Din near the Thai-Burmese border, which entails a 1 hour long motorboat trip along Pai River Ban Huai Dua, a scenic route with marvellous terraced cataracts, or a 36-kilometre drive through rugged land scape. Long Ear Karen is one of the oldest of peoples in this part of the world. Long before any of the present day territories were formed by boundaries into nations or countries, the peoples of Southeast Asia, particularly mountain dwellers, practised a custom known as "Loaded Ears". According to this custom, the ears, being one of the most sacred parts of the body, were an important object of adornment. For beauty in the women and for strength in the men, the ears of both sexes were loaded. Today, among the Karen-Padaung of Phrae and of Burma, this tradition is continued for the female gender only, once married. Red Karen (Kayah or Kayah Li) is a member of Karen branch of the Sino-Tibetan language family. 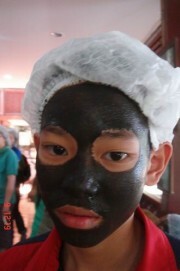 It is spoken by about 210,000 people in the Kayah and Karen states of Burma (Myanmar). The language and people who speak it are also known as Western Kayah, Karenni, Karennyi, Red Karen, Yang Daeng or Karieng Daeng. Travel:trip route Returning route by Highway No.1095- Mae Hong Son town - Ban Rak Thai - Pang Ung – Phuklon - Fish Cave tham pla - Them Lod - Pang Mapha – Pai - Chiang Mai . “Fish Cave national park” (tham pla in Thai) About 17 kilometers (10 miles) from Mae Hong Son town is the small Fish Cave (tham pla in Thai) national park. The name is a bit misleading. There's no cave that you can really go into. The park surrounds a place where a small stream emerges from the rock face of a hill.However, there are definitely fish. Big brook carp of a kind found only in a very few places in Thailand. The fish grow up to a meter (three feet) long and appear deep blue in color. 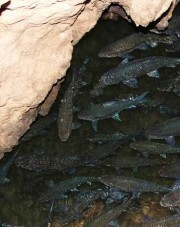 The fish seem to like to cool water of the cave, and you can see them 'queuing up' to get in. There's another small opening a few steps up that allows you to look down into the cavern, which appears to be filled with the fish. The park is a cool shady place with forests of trees lining the cool stream flowing out of the hill. Beyond the stream, near the park entrance, is a large open space suitable for pitching a tent. There are also a number of food stalls and restaurants around the entrance. While the Fish Cave itself is not a really spectacular sight, the cool environment and ample amenities make it a very pleasant spot to plan a lazy afternoon. 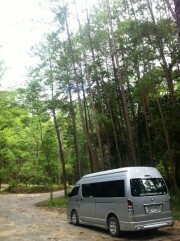 Then driving on to the Among the unspoiled nature. Pang Mapha On The Way Stop to Pang Mapha is the northernmost district (Amphoe) of Mae Hong Son Province, northern Thailand. In the Shan language, Mapha or Makpha means lime and Pang means hill, so a translation into English might be Lime Hill. Several prehistoric sites are known with in Pang Mapha area. The most famous one is the Spirit Cave, discovered by Chester Gorman in the mid 1960s, was occupied from.
" HEAVEN DOES REALLY EXISTS IN PAI "
Huai Nam Dang National Park Located on the joint border between Mae Taeng District of Chiang Mai and Pai District of Mae Hong Son. 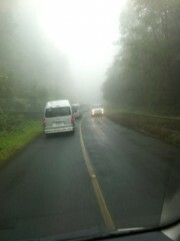 Total area covers 179.5 sq.kms Here the scenery is beautiful, especially the sea of flying mist in the morning. Many tourists like to come and pitch tents (there is minor charges for pitching tents), tasting the cold weather at the top of these high mountains whilst awaiting the dawn mists. Interesting places are: Doi Kiew Lom Viewpoint On the top of the hill, one can enjoy a panoramic scenery, stretching up to Doi Luang Chiang Dao. The view is very beautiful, especially in the morning, when the flying mist fills the whole valley, revealing just a sharp top of Doi Luang Chiang Dao. Be there and imagine how beautiful it would be. Doi Chang Viewpoint The highest spot of Huay Nam Dang National Park. Here is the origin of several waterfalls. 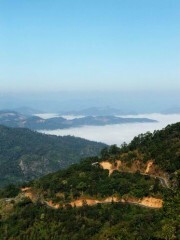 Located in the north of Ban Huay Nam Dang, there is a famous viewpoint in the morning. You can look around a sea of mist and mountainous scenery, stretching away for about 20 kilometers. The route is still a laterite one. Pong Dueat Hot Spring If you are in your own vehicle you need to take route 1095 to kilometre 42 until you reach a road that leads to Pong Dueat Hot Springs. However, it is possible to get on a tour from Mae Hong Son that takes you to the site and this is probably the most effective way to approach a visit. This is really quite an impressive place to visit. There aren't that many places in the world with hot springs and Mae Hong Son is one of them, so if you are in the area, make the most of it! Set in thick forest, Pong Dueat Hot Springs comprises 3-4 geysers (with water bursts that shoot 2-4 metres into the air) alongside a number of smaller springs. The temperature of the water reaches 99 degree centigrade. Four wheel drive 12,000baht per 1car "Car Adventure. " 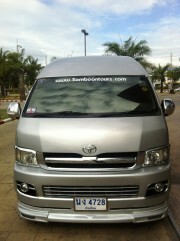 air condition service with a driver who has expertise in the path: for 2-6 person rental with driver. (including fuel and insurance). Van D4D 14,000baht per 1van "VIP style D4D" air condition service with a driver who has expertise in the path: for 4-11 person rental with driver. (including fuel and insurance). Government Savings Bank Branch: Meechok Plaza Chiangmai-Phrao Road. Amphoe Mueang Chiang Mai Thailand.